Wait, what would happen if a Mars rover sprung a flat tire? 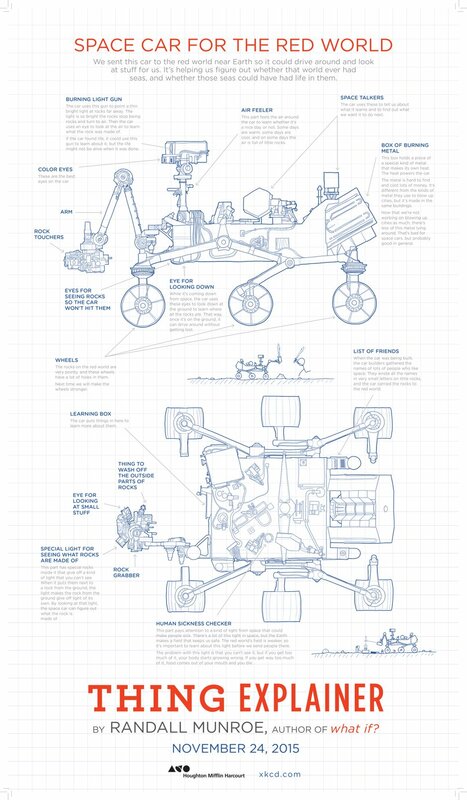 Randall Munroe, a guy who famously ditched his job building robots at NASA to draw the xkcd web comic, announced via blog post this morning that he’s working on a new book due out this fall. Nerds, get ready to pre-order. The annotations are totally jargon-free, thanks to the fact that the entire book is written using only the thousand (technically, “ten hundred”) most common English words. That self-imposed limitation gives the book a quirky, riddle-like quality—for instance, it takes a second to realize that “really tall roads” signify “bridges.” As a result, it reads like it could have been written by a young whippersnapper who knows a lot about plate tectonics and cellular biology, but not so much about idioms. That weirdness makes this smart book a fun one, too. Thing Explainer: Complicated Stuff in Simple Words; $24.95, from Houghton Mifflin Harcourt.